Premises liability covers when you are on someone’s property and there’s a negligent act that occurs on that property and causes you injury. There is something of a defective nature that has existed on the person’s property and, as a result, they caused injury to the other person who was invited onto the property or came onto the property for some reason. The person who owns a property has a duty of care to those people who enter the property and therefore may be liable. What Types Of Accidents Or Injuries Could Premises Liability Include? In slip and fall type accidents, broken bones and sprains are common. 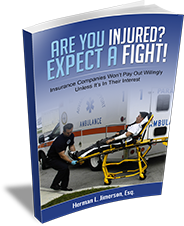 These injuries are not as serious as those we see in auto accidents but can still be significant and result in pain, suffering, and medical expenses. What Is Causation In Premises Liability Law? Causation is what has caused the accident. What did the property owner do or fail to do that contributed to the injury associated with what’s being claimed? If I had a pothole in my yard, I failed to fix it, and someone fell into it and injured themselves, it is a legal cause for damages. With every legal case, there has to be some proximate cause that is the reason why this person has an injury. Is Comparative Or Contributory Negligence Applicable In Premises Liability Cases? In Missouri, comparative negligence is applicable. Comparative negligence is simply the apportionment of fault to both sides. In most situations, one side’s comparative fault is a high percentage compared to the other side’s. The judge will assess the damages based on the amount of fault attributable to that party. What Damages Typically Are Available With Premises Liability Lawsuits? The damages in premises liability cases are general damages including medical expenses, pain and suffering, and lost wages. Can Punitive Damages Be Recovered In My Premises Liability Case? Punitive damages can be awarded in premises liability cases but it’s rare. Punitive damages are awarded to instruct or to punish the property owner. In premises liability cases, these types of damages are reserved for the only the most severe circumstances. For more information on Premises Liability Claims In Missouri, a free initial consultation is your next best step. Get the information and legal answers you are seeking by calling (314) 786-3536 today. Home > Personal Injury > What Actually Is A Premises Liability Case?